At Hammerhead Pools, we understand the value in maintaining your pool and hot tub investment. That is why we offer multiple tiers of premium pool maintenance service plans to meet almost any budget for residential and commercial clients all across the Sacramento Metro Area in California. Our monthly billed service plans provide weekly services including pool chemistry maintenance, equipment inspection and maintenance, brushing, debris removal, vacuuming, skimmer basket maintenance, and more. Further, we log each visit and leave a convenient door hanger letting you know our crew was on site and a detailed list of services provided. We will even provide custom tailored services for small or large scale accounts with specific needs or those on the edges of our service area. Nothing ruins a hot summer weekend in California like malfunctioning equipment that prevents use of the swimming pool. Hammerhead Pools provides full service repairs and equipment replacement both as a one-time service and as a part of our monthly maintenance service plans. Repair services are especially critical for commercial pools, hot tubs, and water features like those found in hotels, casinos, and community pools open to the public. For these type of accounts, we provide 24/7 around-the-clock, emergency repair services throughout Sacramento and the surrounding Metro Area in California. We can also evaluate pool equipment systems for both residential and commercial clients and provide a free estimate for upgrades to more energy efficient pumps or heaters, and effective pool, hot tub, and water feature filtering systems. Transform your home into a resort with a new hot tub, spa, or swimming pool. 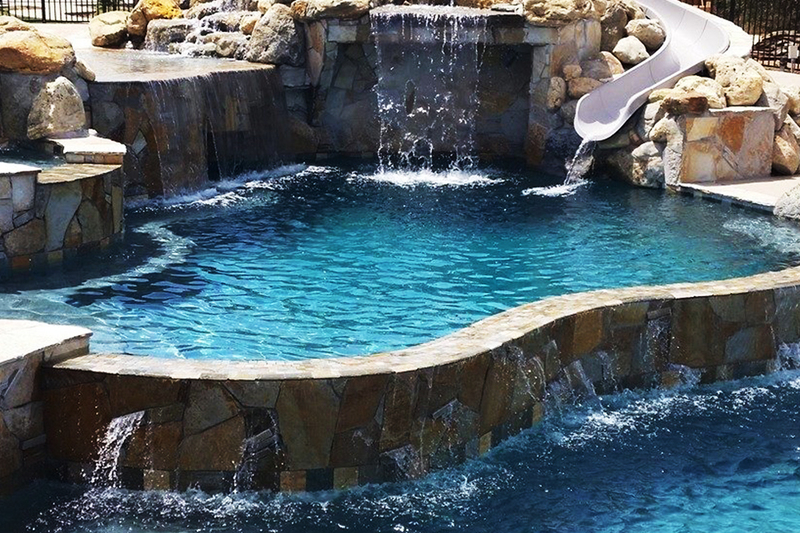 We at Hammerhead Pools have been lucky enough to create and build high quality swimming pool, spa, hot tub, water feature, and outdoor kitchen projects for clients all around the Sacramento, CA area. Each job is a chance for us to demonstrate superior trade construction skills and the value in customer service, warranty, and working with a company you can trust. For over a decade, we have maintained a goal of complete customer satisfaction. A handshake at the end of a project is all we need, but we certainly do appreciate when our customers take the extra time to review our services for others. Please feel free to see our reviews on Yelp and Home Advisor. We also wanted to spotlight some of our favorites, here is what a few of our customers had to say. "Mike and his employees did an outstanding job installing the equipment on my pool two years ago. I recently had a glitch in the computer system and the pool sweep stopped functioning. One call to Mike is all that it took. He responded to my residence on the next business day to trouble shoot the problem. It required a second service call to update the system and he did so in short order. He is knowledgeable and personable when getting the job done. He is my pool professional of choice." "I am very happy with Hammerhead Pool Service. I've been with them going on 4 years now and they have consistently provided professional, friendly, reliable, and knowledgeable service and maintenance. Mike, the owner, is helpful and makes the extra effort to ensure things keep running smoothly. One time, he got in the pool wearing a scuba suit to install a new pool light. It's nice to know that my pool is being taken care of, and it's one less thing for me to deal with." "I'm so happy that I have Hammerhead Pool Service taking care of our pool and spa. I found out about them when I saw their service truck at my neighbors house so I had Mike come over to take a look at my pool and the equipment. The cost of my weekly maintenance is very reasonable and they take care of problems before I ever have to ask. They really go the extra mile for me. I highly recommend this company to everyone who is looking for help with their pool." "FINALLY, I found a pool company that I can trust to clean my pool so it looks like the resort pool I have always wanted. Over the past 10 years I have had 4 different pool services. All of them started out OK, but then after a few months, they spent less and less time cleaning. Then eventually, just running into my backyard, testing the chemicals and running back out. I love Hammerhead pool service because Mike hires hard working trustworthy guys like Ben and Dean. Ben is my pool guy. He is reliable, friendly and does an excellent job making sure my pool chemicals are adjusted properly. He scrubs my pool every week. My pool is crystal clear and free of leaves.I am truly happy with Hammerhead Pool Service."